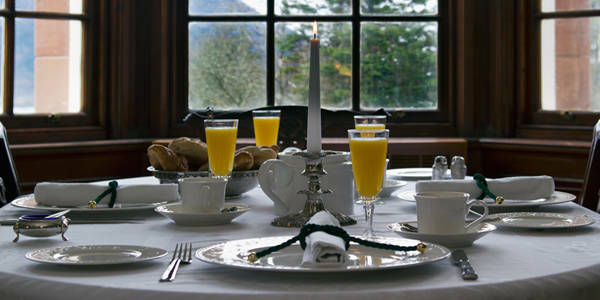 It is said that you should breakfast like a King and you certainly have this opportunity at Glencoe House. Breakfast in The Glencoe House Suites is served at your private dining room table in your sitting room which allows you the luxury of easing yourself into the day sitting in your robe; reading a newspaper of your choice and admiring the view. Breakfast is served at a time of your pleasing; you just need to place your order the night before. Breakfast is composed of a number of separate courses that will be served to you at your private dining table at time intervals that suit you; please note that your breakfast choices do not come to your suite altogether unless requested. A wide selection is on offer and all is served on Villeroy & Boch china for a refined breakfast experience. A sample of our breakfast menu can be found here. Option 1: Breakfast within The Bell Tower Suites is secluded and private; you can even dine alfresco in your private walled garden should the weather allow. 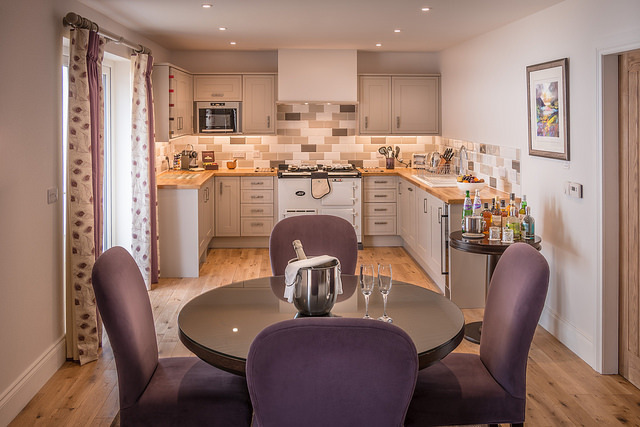 As standard your kitchen will contain a full range of breakfast options including ingredients for scrambled eggs with Scottish smoked salmon, a full Scottish breakfast or crusty rolls and a selection of cold meats and cheeses for a continental alternative. Breakfast is catered for although guests have to prepare and cook their breakfast which has the advantage of allowing you to stay in your pyjamas and read the complimentary newspaper without being interrupted by waiting staff. A suggested Bell Tower breakfast menu can be found here. Option 2: Book breakfast in the Great Hall, if you would prefer the chef to cook one of his breakfast delights for you, please book breakfast in the Great Hall by 6pm the previous evening and it is a great way to start your day. A formally served full breakfast for Bell Tower Suite guests served the Great Hall is £12.50 per person. A sample of our breakfast menu can be found here.